On a black monitor in a dusty office in MIT’s Green Building, an iceberg the width of three football fields wallows in the shallow, briny waters of the Persian Gulf — also known as the Arabian Gulf — 6,000 miles from its home. Facing the screen is Maryam Rashed Alshehhi, a visiting assistant professor and recent doctoral graduate from the Masdar Institute of Science and Technology in the United Arab Emirates (UAE). Using advanced climate models, Alshehhi is estimating how quickly an iceberg will melt in one of the warmest regions in the world, and how existing water and wildlife, long accustomed to a parched dessert climate, will react. The mirage-like simulation is not entirely hypothetical. Engineering firms in the UAE have recently touted plans to tow chunks of ice wrapped in plastic from Antarctica to the coast of the gulf to be used as fresh drinking water. There is perhaps no one better to vet the plan’s plausibility than Alshehhi, who in 2016 became the first United Arab Emirates national to get a PhD in earth observation and ocean color remote sensing. 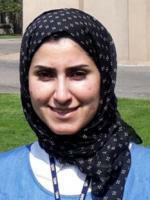 Since March, Alshehhi has been working in the Department of Earth, Atmospheric and Planetary Sciences’ (EAPS) Marshall Group to create the first-ever climate models of the gulf, a small body of water in an arid region where water availability and environmental standards have historically taken a back seat to rapid urbanization and oil interests. Alshehhi comes to Cambridge, Massachusetts, as a part of a collaboration between MIT and Masdar Institute, a research-focused graduate university located in Abu Dhabi. The program, called the MIT/MI Cooperative Program, started in 2007 with the aim of strengthening the country’s research capabilities to transform its oil-based economy. Over 93 joint research projects have resulted, many focusing on sustainability issues, such as Abu Dhabi’s urban heat island effect and the nation’s growing thirst for fresh water. Alshehhi grew up on the heels of the oil boom in the UAE. The second youngest of seven siblings, she was raised in Ras Al-Khaimah, a coastal city of a 345,000 or so nestled in between Dubai and the country’s easternmost tip. The explosive rise of industry in the country paved the way for her and her siblings to be the first college-educated generation in her family. As an undergrad, she followed in one of her older sister’s footsteps, studying chemical engineering at Khalifa Institute before switching to environmental engineering during graduate studies at Masdar Institute. Oceanography, she realized once in graduate school, proved to be a challenging field of research in the UAE. For one, collecting data in the Persian/Arabian Gulf “is not easy at all,” she says. The extreme heat, which averages 41 degrees Celsius (106 degrees Fahrenheit) during the summer, makes for painstaking fieldwork. And on numerous occasions a research vessel that Alshehhi was aboard was ordered to turn around because it was approaching another coastal country’s waters. But more often, Alshehhi recalls the excitement of being a part of the nascent field. She contributed to the first field campaign in the gulf region that followed NASA protocol, resulting in the first data on optical oceanography in the Arabian Sea. Alshehhi’s graduate research focused on monitoring the gulf from above, using satellite imagery to track biological life. The work produced a clearer picture into the enormous economic and ecological cost of the country’s engineering infrastructure, such as its desalination plants. Currently, to meet fresh water demands, the country relies on 31 water desalination plants to run around the clock, purifying the equivalent of 4 billion bottles of saltwater a day. The plants pump the waste, a salty sludge, back into the gulf, resulting in steadily rising salinity levels in the gulf, threatening local fauna and marine life and causing outbreaks of algae blooms. Dust storms in the region make it difficult to use conventional satellite images to detect these harmful algal blooms. Alshehhi and collaborators developed algorithms to clear the noise from these images by looking at the spectrum of satellite signals and eliminating some of the radiance of the aerosols. The results, which are published in Geoscience and Remote Sensing Symposium, became Alshehhi’s PhD dissertation. In 2016, Alshehhi became the first UAE national to successfully defend a doctoral thesis in her field. Today, at MIT, Alshehhi’s work on the gulf goes beyond looking at just its surface. Together with John Marshall, EAPS Cecil and Ida Green Professor of Oceanography and expert in global ocean circulation modeling, she is creating in-depth models of the gulf using numerical and theoretical frameworks supported by field and satellite data. The project, which is in the first of its three-year stint, will be the first record of the area's water columns, circulation, and climate dynamics. Later on, these physical models will be overlaid with biogeochemical models to see how effects like increasing pollution, changing saline levels, and rising temperatures are influencing biological beings in the gulf. Marshall says he’s looking forward to future planned visits to the UAE, where these models will help answer unsolved questions like where the salty sludge from the desalination plants ends up, the link between the dust storm deposits and biological life, and what kind of nutrients are settling into the water — and at what depth. “There are a lot of things that we don’t know, things we have never seen before,” says Alshehhi. The research also comes during a time when the UAE faces some urgent environmental dilemmas. Alshehhi is hopeful her science can provide better insight into such issues, such as the safety of the first nuclear power plant under construction in Abu Dhabi, the impact from pollution left behind from the more than 100 oil tankers passing through the gulf every day, and whether an iceberg can prevent a fresh water shortfall and meet future demand. These problems may be close to home for Alshehhi, but she stresses the broad implications of her research. Alshehhi’s appointment is for a year, which means that next March, she will shed her recently purchased winter coat and boots and return home to the UAE. The snow, she adds with a laugh, makes it a little easier to leave. Maryam Rashed Alshehhi is interested in addressing the coastal ocean problems through using physical and optical oceanography. She uses numerical and theoretical frameworks supported by field and satellite data.